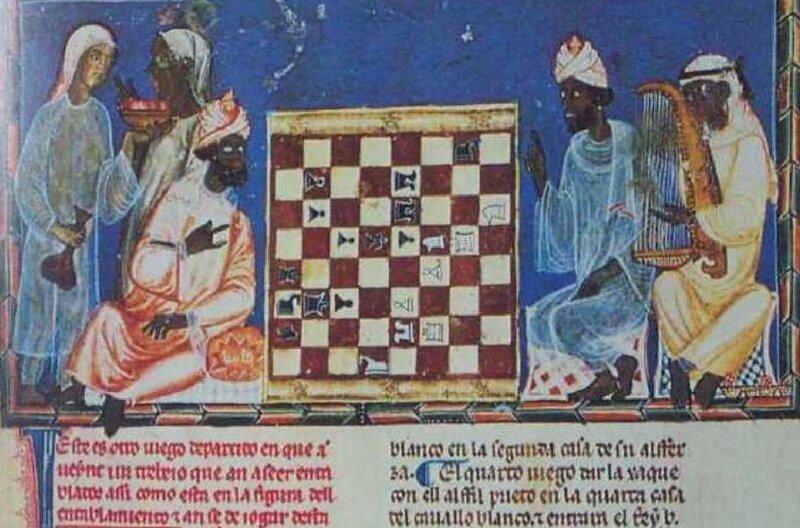 Many of you have heard that the game of chess has African origins and was introduced to Europe by the Moors of medieval Europe. The black and white chessboard is reminiscent of the Moroccan flag that flew during the Almohade Dynasty and resembles the black and white motif seen in Senegalese fabrics. Every piece on the chessboard has its own movement. What I’ve recently learned is that these pieces are conceptual placeholders for terrestrial and celestial objects that contain powerful spirits with specific functions. These distinct functions were all codified by the original “players” who observed how these spirits moved through the 64 codons of human DNA following symbolic acts of ritualistic sorcery. There are 64 squares on a chessboard for a reason. Today, this knowledge is behind the global push for genetically engineered plants and animals and artificial intelligence. There are spiritual intelligences propelled to planet Earth by the sun and these intelligences are disruptive to the Artificiality Agenda of the fading global power structure. Harvard scientists are working on The Stratospheric Controlled Pertubation Experiment to deflect the sunlight in Earth’s atmosphere back into outer space. According to the experiment’s directors the purpose of the initiative is to decrease global warming. The decrease in global warming is merely an EFFECT of the spirits of regeneration being driven away. Let’s rewind this stream of consciousness, though and get back to exploring The Grander Chessboard. The game of chess was a way for one sorcerer to test another sorcerer’s acumen for magic by observing how he strategically moved his chess pieces when faced with a given scenario. Again, these pieces were originally placeholders for natural objects that housed spirits with distinct functions, just like the tools in a handyman’s toolbox have distinct functions. Some spirits move in an “L” formation while others move diagonally. Pay attention. 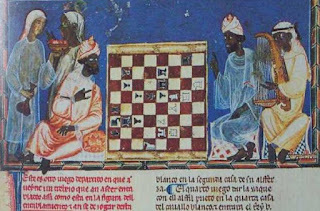 Over time several of the Moorish players lost their culture as a result of neglect, so for many people, it’s just a game now. The symbols of the game remain but the direct knowledge of the actual power behind the symbolic pieces on the board were lost. How did this happen? After many centuries of occupying European lands Moorish aristocrats were so caught up in their material wealth, entertainment and political power, that they began to devalue the spiritual arts that allowed their forefathers to have dominion over European lands by supernatural methods. There were also old Moorish patriarchs who hated on their younger male offspring whom they saw as competitors as opposed to standard bearers for their lofty legacies. These old insecure Moors jealousy withheld knowledge from the young men in order to hold on to power that was already slipping from their feeble grasp during the Reconquista. The Reconquista was a medieval phenomenon in which white southern Europeans starting to take land back from the Moors. Also, in the game of chess the queen’s job is to protect the king. This is why the queen moves with great power and influence on the board. Her job is to spiritually protect the most important piece, and that is the king. But what king does the queen protect when the king on the other side of the board looks more like her than the one who is right next to her? I’ll tell you what happens. Any identity crisis she may have is quickly resolved and you get a king with two queens on the board and another king with none. You can see some of the same cultural dynamics at play during the fall of the Moorish empire happening in hip-hop culture today. A lot of young brothers who are currently at the forefront of the culture were not effectively taught by their jealous elders to value history as a tool of correction and self-edification. Many of them also place a higher emphasis of value on women who don’t look like them and they crown these women who come to them with nothing as queens only to be betrayed in the end. They let men outside of their culture into their secret societies only to have these alien men deliver them to their enemies. You have melodic rappers who make millions of dollars off of hip hop culture, but they disrespect the contributions of artists like Nas, The Notorious B.I.G., Jay-Z, and Tupac who were getting platinum plaques when they were still in their diapers. A lot of these younger rappers utilize melodic flows that are superior to the greats of the 1990s if we’re being honest. However it is also true that their words don’t have the same force of meaning that their 1990s predecessors had. Each word coming out of their mouths are like empty chessboard pieces for which the true power that the piece is a reference point for has been lost. The young men are shooting blanks over infectious polyrhythmic beats and the world STILL loves them because their melodies are that strong. Imagine if they could coordinate the spirits missing behind their chess pieces on the board? There are a few among them however, who’ve retained knowledge of the true meaning and power of the musical chess game and they are inspirations to the millions of youth of their generation. The generation gap will feel this drum beat, and I remain confident that they will also feel the words traveling through the bass. They’ll internalize the meaning behind the melody and take their generation to places we have never been.